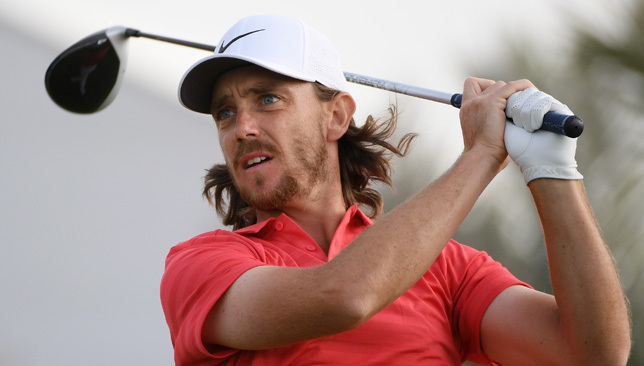 England’s Tommy Fleetwood successfully defended his title at the $3 million Abu Dhabi Championship Sunday, shooting a seven-under par 65 round to beat compatriot Ross Fisher by two shots. The 27-year-old Southport resident made the turn at one-under par, but was on fire on the back nine. He made six birdies, including one on the closing 18th hole, to edge Fisher. The back-nine heroics of Fleetwood, ranked 18th in the world and expected to rise to No10 when the new list is released Monday, included making a 25 feet putt for birdie on the 15th hole to tie for the lead with Fisher, and then a 50-feet birdie putt to take outright lead on the 16th hole. Fisher (69) started the day in impressive fashion with an eagle on the second hole, courtesy a 45-feet putt, and was four-under at the turn. But on the back nine, he made a bogey on the 10th and a solitary birdie on the 16th hole to finish on 20-under par. Last year, Fleetwood beat the reigning world No1 Dustin Johnson by one shot, kickstarting a successful season that culminated in him winning the European Tour’s Race to Dubai. Johnson (70) finished on 14-under par this year, while former world No1 Rory McIlroy shot a 70 to tie for third place at 18-under par alongside Matthew Fitzpatrick (69). Overnight joint leader Thomas Pieters (72) and winner of last week’s South African Open, England’s Chris Paisley (69) were tied fifth at 17-under 271. His game has been largely perfect, he looks almost like the player of old, but Rory McIlory admits a first win in 16 months – and at a venue where he’s been oh so close, so many times – would build confidence hugely for the rest of 2018. The Northern Irishman is certainly well placed to make a winning return from a three-month injury lay-off following a seven under par 65 at the Abu Dhabi HSBC Championship Saturday – placing him third, a shot behind joint leaders Thomas Pieters and Ross Fisher. 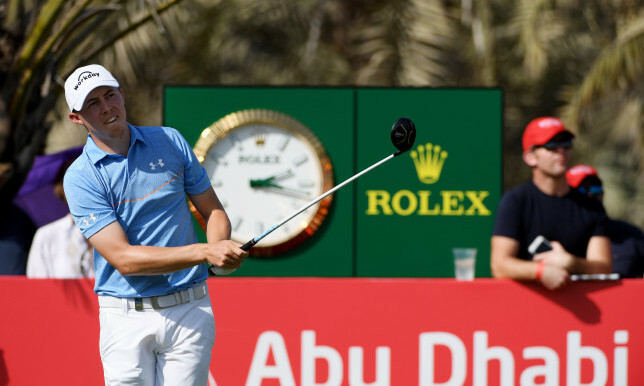 The four-time major winner has had a number of near misses on previous appearances in the UAE capital – he finished runner-up in 2011, 2012, 2014 and 2015, as well as coming third in 2016 – and is keen to finally lift the trophy in his first competitive start since October. “It would mean a lot to win on tour again,” admitted McIlroy, 28. “I’ve had a lot of close calls here, I think about six top threes or something like that. I’ve never won my first start back out either. The four-time major winner had gone 50 holes without making a bogey before his run finally ended at 15 – it was the world number 11’s longest bogey-free run on the European Tour. And the game plan for the final day is to keep doing what he’s been doing. “Same as the last three days,” added McIlroy. After 15, McIlroy chipped in for birdie two holes later at 17 and a 65 left him well placed to make his return to action a winning one, since ending his 2017 in October due to a niggling rib injury, although it also transpired that a slight heart irregularity was also discovered. And although he is desperate to win to both stop the rot both in the larger sense and in Abu Dhabi, he is looking at the bigger picture. 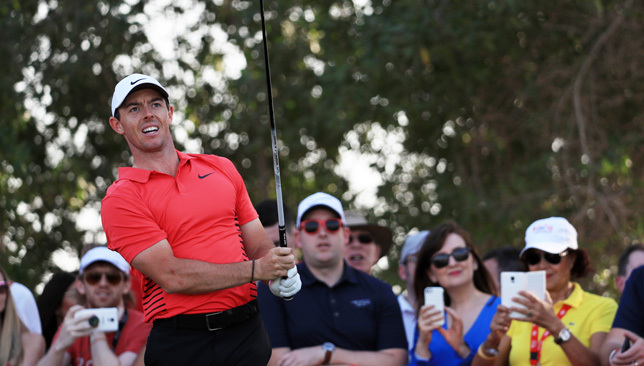 “All in all it was another great round and another really good confidence builder, not just for this week but for the rest of the season, as well,” said McIlroy, who last won at the TOUR Championship in Atlanta in September, 2016. “I’m really pleased. I said all week, I felt like this is where my game was in practise, but it’s always different trying to go from the range on to the golf course, and even in practise rounds, I felt like I was playing well. “But it’s still different whenever you get a card in your hand and you’re in competitive play. 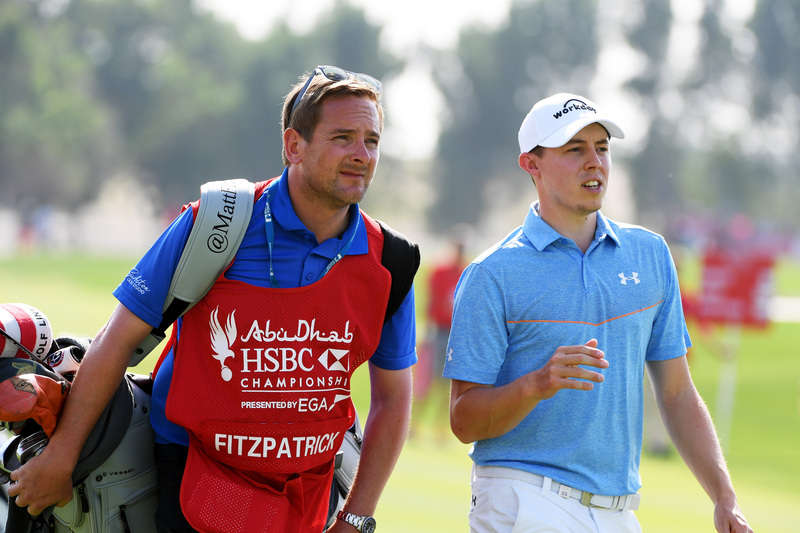 Despite shooting the lowest score of the week and coming within one stroke of equalling Henrik Stenson’s course record, Matthew Fitzpatrick claimed he felt he didn’t actually play that well at the Abu Dhabi HSBC Championship Saturday. The bright young English prospect, 23, blazed a trail in the capital city sunshine as he soared up the leaderboard and into contention for the Falcon Trophy with a scorching opening 12 holes, which included nine birdies. There was a bogey and four pars on the final six holes, but he ended with birdie on 18 to finish on -15 under, tied for fourth with reigning champion Tommy Fleetwood, just two shots off the lead. That is held for a second night by Belgium’s Thomas Pieters, along with England’s Ross Fisher, who shot -5 and -7 under rounds on moving day. Fitzpatrick recorded the second best nine holes of his career on the front, but admitted his tee and long game didn’t feel completely right. “It’s a real funny one because I don’t feel like tee-to-green I played that well,” said the Sheffield native. “I’m sure people will be sat at home thinking ‘he must have played well’. Don’t get me wrong, I had a lot of good approaches, but just struggled a little bit off the tee. “That front nine is up there among my best. It’s actually my second best, I managed 28 a couple years ago at the KLM Open. “I heard on the putting green this morning DJ (Dustin Johnson) shot -8 under Saturday and apparently it was the easiest -8 under the guys have ever seen, but mine was a little bit of a different story, probably the most difficult. Fitzpatrick is the eighth player to shoot 64 or less in the history of the tournament and was so happy he admitted he was contemplating taking his putter to bed with him last night. “Maybe take it to bed, I don’t know,” joked Fitzpatrick, who was happy despite missing out on equalling the course record of 62, set by Henrik Stenson on the same day in the inaugural running of the tournament, in 2006. And the strategy for Sunday? EurAsia Cup team-mates Pieters and Fisher share the lead in the capital, the big-hitting Belgian adding four front-nine birdies to a flawless 65 on Friday to remain ahead of the chasing pack. The birdies dried up somewhat on the back nine and eventually Fisher reeled him in with a birdie on the last to lead on -17 under. 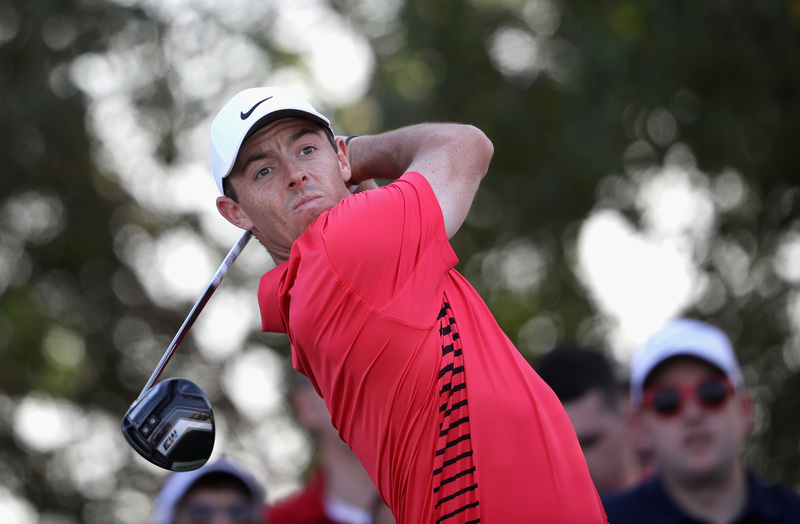 McIlroy is third, Fitzpatrick and Fleetwood share fourth as members of Thomas Bjorn’s victorious European side from last week’s contest with Asia fill four of the top five places. Pieters said patience is key, after failing to grasp a few chances for birdie on the back nine. “When the conditions are perfect and you see everybody making a bunch of birdies and I was hitting it close, but I just wasn’t making the putts,” said the 25-year-old world number 40. Fisher, like Pieters, turned in 32 to keep tabs on the leaders, and caught Pieters at the top when he converted a 20 footer on the 14th. Pieters went ahead once more on 16, but could only find a greenside bunker in three on the par five last and was unable to match Fisher’s bogey, with Pieters signing for a 67 and Fisher carding a 65. Fisher is excited to have a chance to add his name to the list of winners Sunday.